In celebration of World Water Day on March 22, the Department of Environment and Natural Resources, Region 10 (DENR 10) will spearhead the celebration by making people from all walks of life committed to work together for cleaner rivers. With tagline, FoRIVER – Together forever for cleaner rivers and #riversforlife, the Department of Environment and Natural Resources, Region 10 (DENR 10), local government of Macabalan, Cagayan de Oro City and various stakeholders will gather more than 1,000 participants for a clean-up in Barangay Macabalan, Cagayan de Oro City. DENR 10 Regional Executive Director Arleigh J. Adorable said the activity aims to raise awareness on the importance of water and sustainable development. He said the celebration will remind the people to value fresh water and promote sustainability for fresh water resources management. “With the active support of the local government units, private and public sectors, we hope that we can sustain our efforts to cleaner rivers in the region. It is important that residents of the area will do their share in taking care of our environment,” he said. The celebration will start with a program at 5:45 in the morning in Macabalan Covered Court to be followed with the clean-up of seven areas. A signing of Covenant of Membership on Tayo ang Kalikasan, with partners from the local government unit, other government agencies, civil society organization, business sector, academe, religious groups and other stakeholders, will be part of the program. The seven clean-up areas include Cilrai, Piaping Puti, Piaping Itum, Punta, Barra Proper, Barra Riverside/Barra Shoreline and Accretion. Purok leaders will lead the participants to their assigned areas. Each participating agency or group will be assigned a clean-up area. The line bureaus of the DENR namely the Environmental Management Bureau, Region 10 and the Mines and Geosciences Bureau, Region 10 take active part in the activity. The City Government of Cagayan de Oro with the Hapsay Sapa Project will mobilize its personnel for the activity. To heighten the awareness of the students on the importance of water and sustainable development, the DENR 10 will conduct school lecture on March 19 in Macabalan National High School. Clean-up activities will be undertaken on the same day by the Provincial Environment and Natural Resources Office (PENRO) of Misamis Oriental and Community Environment and Natural Resources Office (CENRO) of Initao at Bitan-ag Creek, Lapasan, Cagayan de Oro City while the Community Environment and Natural Resources of Gingoog City will be along Gahub river in Gingoog City. An information campaign will also be conducted in Mapua Elementary School, Balingoan, Misamis Oriental on March 20. 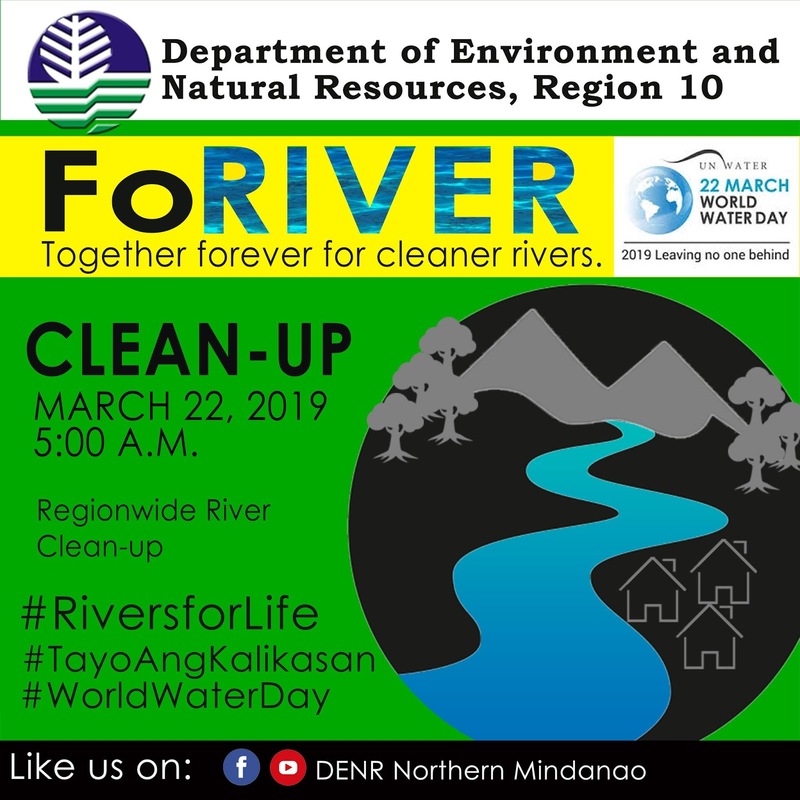 In Lanao del Norte, CENRO-Iligan will conduct a clean-up along Baloi River on March 15, PENRO-Lanao del Norte and CENRO Kolambugan will hold a clean-up along Maranding River on March 22; and the PENR Office of Camiguin will hold a clean-up in Guinsiliban River on March 20. An information campaign in Lawigan Bura National High School, Guinsiliban will be done on March 22.